Got an older style 5-Pin MHL 1.1 Cable which doesn't work on your new Samsung Galaxy S3, S4 or Galaxy Note 2? Well this little adapter is for you! Please note that this product is an Adapter for 5-Pin MHL (1st Generation v1.1) Cables to work on newer phones which require MHL 1.2+ connections (2nd, 3rd & 4th Generation). 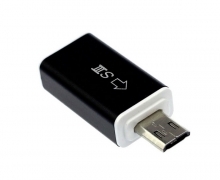 This MHL Adapter requires a 5-Pin MHL Cable, HDML Cable and Micro USB Cable to work. This 5-Pin to 11-Pin MHL Adapter lets you use 5-Pin MHL Cables, which are designed for older phones (like the Samsung Galaxy S2), on newer phones with an 11-Pin MHL Socket, including the Galaxy S3, S4 and Galaxy Note 2. Sometimes new tech is fun and exciting, and sometimes it's just plain confusing :( Take for example, when Samsung decided to release the Galaxy S3 phone, and change the Micro USB socket from a standard 5-Pin connection, to an 11-Pin configuration. The socket doesn't look any different to the naked eye, and your old Micro USB cables will work just fine for Sync and Charge operations... but if you wanted to connect one of tose fancy new MHL (Mobile High Definition Link) cables for HDMI putput, you'd need a new 11-Pin MHL cable. So that's exactly where this nify little MHL Adapter comes in. If you've got a 5-Pin MHL Cable, design for products like the Samsung Galaxy S2, then this adapter will let you use that MHL cable with a newer Samsung phone or tablet. NOTE: Please note that this adapter is ONLY required when using a 5-Pin MHL Cable and the above devices. This adapter is NOT REQUIRED when using a 11-Pin MHL 1.2+ Cable. Watch your movies and games on the big screen! Important Note: For MHL output to HDMI, your MicroUSB cable (included with your phone) must also be connected to the USB female socket provided on this adaptor. You can then connect the other end of your USB cable to any USB port (like on your TV or Computer). The USB port does NOT need to be a powered, so once this connection is made, you will have full Mirrored output! Cable Chick's 5 Year Warranty!